Are these the 12 faces of Chiron — or just a bunch of actors in funny clothes? If you want to get a handle on a certain well known asteroid/planetoid/…er… comet… er … thingie whizzing around between Saturn and Uranus right now, then you might do well to watch a certain well known British children’s TV show. Here in Blighty we have been besieged by the BBC’s publicity department for weeks leading up to the 50th anniversary of Doctor Who, the longest-running science-fiction show on TV. It features a mysterious person, known only as the Doctor, who travels through both time and space in a blue policeman’s box, the Tardis, which is “bigger on the inside”. In his travels, the Doctor picks up companions — oddly enough usually young and good-looking ones — fights aliens, and saves the odd galaxy or two. But most of the time, he seems to be here on Earth, a place which is dear to him apparently because we humans are so super. The really clever thing about the Doctor is that he can’t die, instead he regenerates, which means that every now and then the actor who plays him is replaced. Doctor Who was born in 1963. This year, 2013, we are going to meet the 12th doctor, when actor Matt Smith, who has been playing him since 2010 leaves to replaced by Peter Capaldi. Pretty much everyone in Britain under the age of 60 has “their doctor”, the one who epitomises Whoishness for them. It’s hard to overstate the importance of the character of Doctor Who in the national psyche. Almost no one else unites the country across class — although I feel the Doctor spends far too much time in Cardiff and London. Even if you never watch the show, you’ll know what the Tardis is and you’ll recognise the theme music created by Delia Derbyshire. But who or what is the character? And how curious that the show is having a Chiron Return now, since Chiron is, of course, a doctor himself. But they have more in common than that. Doctor Who, no matter which actor is playing him, is a maverick. He is his own person, answerable to no one. This also describes Chiron. One of the features of Chiron is his weaving, wandering orbit as he travels through space, wandering between Uranus, Saturn and Mars. In each sign of the Zodiac, Chiron also seems to change utterly — indeed to regenerate. Since the show began, Chiron has travelled through each of the 12 signs of the Zodiac, and this winter he is returning to 10°, the place where he was when Dr Who was born. Here is a little chart of the Doctors and the Chiron signs at the time. Just a bit of fun. Pisces John Hurt (2013) or some time in the Scorpio/Sag hiatus. Pisces Peter Capaldi — yet to come. The show that aired on Saturday reunited three iterations of the Doctor — the father, the son and the holy ghost perhaps — and allowed them, working together, to redeem a terrible crime the Doctor committed in the past. In fact he had destroyed a galaxy in order to stop a war, but the three versions of himself go back in time and freeze an entire planet in time in order to preserve it. So the story is about healing. Wounding and healing, scar-tissue: this is the realm of Chiron. But especially of Chiron in Pisces, the sign of redemption. Doctor Who inevitably reflects the spirit of the times in which it’s made, so early episodes were a response to WW2 and the Cold War, but also to colonialism. The Doctor of the noughties is a war criminal. He arrived on our screens soon after Britain’s post-colonial colonial adventures in Iraq and Afghanistan were launched. We learn through the series that he made a fatal mistake and that he is the one surviving member of his species, the rest having perished in a war. We suspect that the Doctor had his finger on the button of a weapon of mass destruction. He is haunted by loneliness and guilt. In 2013, he is able to go back in time and change that. If only it were so easy for the rest of us. It might be too much to claim that the Doctor is an embodiment of Britain’s conscience, but a comparison of the two charts is intriguing. 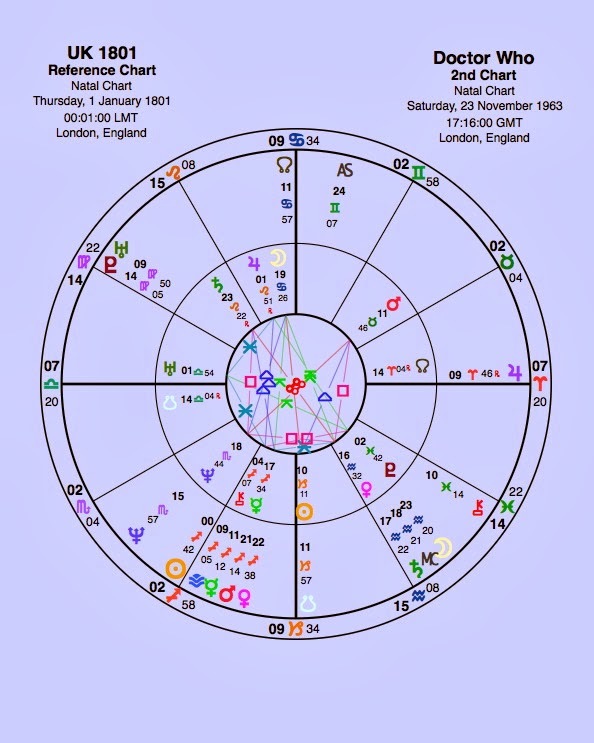 First of all, you can see the Nodes of the Doctor’s chart align perfectly with the MC/IC axis of the UK chart and the UK Sun. There is destiny here. The Doctor’s MC/Saturn aligns with the UK Venus — a long, long love affaire that keeps Doctor Who at the top of the charts. Doctor Who has a major stellium in Sagittarius — as you would expect from a traveller. The Sun is at 0° too, which exaggerates the Sagittarianess. This stellium falls in the UK third house of communications, with the Sun on the cusp. And there is the UK Chiron aligning with the Doctor’s Sun. Is Doctor Who so popular here because it allows us to examine national wounds through the lens of art. You can see that Venus is involved here and Mars and Mercury. So often in Britain, it is children’s books that truly get to the soul of the nation — Alice, the Lion, Harry Potter. This is reflected in the Chiron-Mercury conjunction in the third house of writing, but also both Pluto (penetrating truth and cruelty) and Venus (art) in the fifth house of children. Is The Doctor’s exile from home an iteration of the exile so many English children have suffered at boarding school? Or the exile of going to, say Helmand province as a soldier? In this country, you can join the army at the age of 16. (The UK is the only country in Europe or on the UN Security Council to allow this.) If you are sent away, you must harden your heart and stiffen that upper lip. At the top of the Doctor Who chart is that Saturn/Moon conjunction in Aquarius (the sign of science). This aspect is about compartmentalising your emotions, stopping them before they become too much. Of course, this same ability to compartmentalise makes warriors. That Saturn/MC lines up with the UK venus (art) in the 5th house of entertainment – a show about science, and Saturn exactly trines Neptune, a show about science fiction. Just like the centaur Chiron, the Doctor chooses to be an outcast from his own people and make his home among strangers whom he teaches to look at the world without cynicism. The Doctor’s 11th house Jupiter (large audiences, popular appeal) falls exactly on the UK Descendant – each of us feels we have a one-to-one relationship with the Doctor. That one to one relationships is, as often as not with an actor with an Aries Sun. You’d think it might be a Sag if you only had the Doctor’s chart but you can see that the UK chart has Aries on the Descendant. Finally, the planet of illusion, glamour and film-making, Neptune was having it’s once-in-every-160-years Return for the UK in the year that the Doctor was made (and the Beatles cut their first LP). 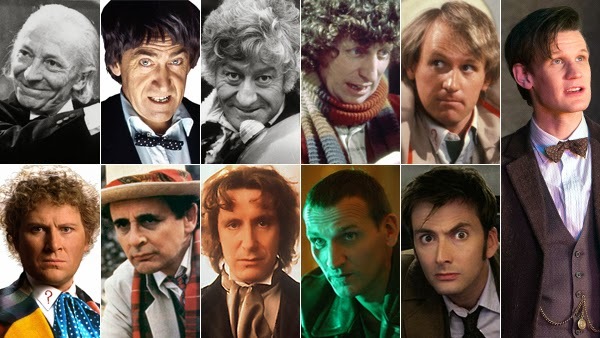 I am a bit fuzzy about early Doctor Who, so I’d be interested to hear what you think especially vis a vis the changing face of the Doctor and what this says about the times. Ha! Yes, there is a long, woolly scarf in the hall that my mother-in-law knitted for D back in the day, and which he still treasures. You have no idea how spot on this observation is to someone with Chiron in Pisces conjunct EXACT to the ascendant! And golly,how the penny is felt dropping as my own Chiron return is fast approaching too. 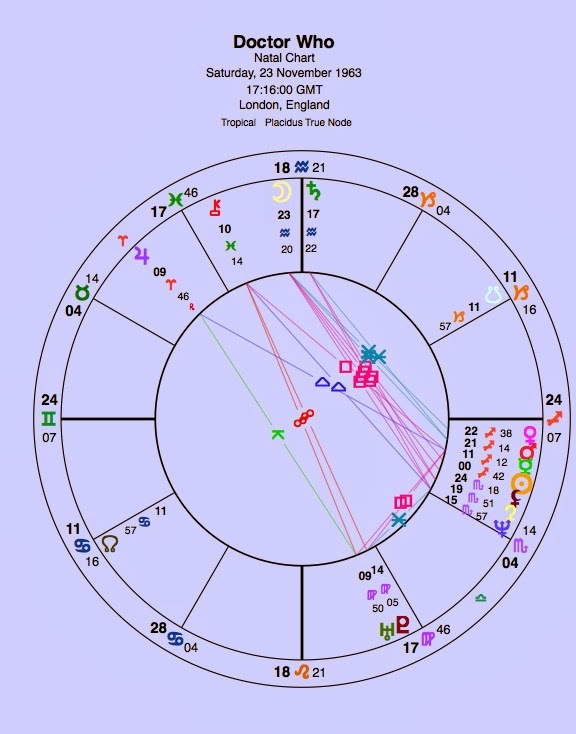 This brilliant astro observation not only connects the dots with the British cultural/historical/collective media unconscious but also is an absolute gem for understanding Chiron if you happen to have a strong natal Chiron placement. It is by far the most comprehensive, one sentence definition of a sensitively placed Chiron I have EVER come across. I just HAD to tell you this and I truly apologise for the solipsist intervention. So much to say in response to this article but too gob smacked from a personal perspective right now…suffice to say that as a stranger to this land (planet! )since 25 years back, Dr Who strikes me as one of those eccentric British public phenomena ( you have to be born here to really have that in-your-blood love for of Dr Who and the Daleks?! ), which can be totally accepted from a felt perspective but rationally really weird and alien for a non-native to take on board. As an ‘alien’ myself, I now see Dr Who as someone who somehow appeases us foreigners to this place (a rainbow bridge?). Chiron, after all, is the outcast in us all, and if you find yourself in the orbit that defines the reason and the struggle with the status quo (if you don’t know why you left your own ‘planet’ in the first place) what better than the Doctor to help define our own journey of individuation. I salute you for your wonderful mind and ability and passion to share so uniquely the connections that you make. I only wish that my own Neptune-Mercury-Saturn menage-a-trois would wake up to the joys of a more erudite expression! Keep up the good work and thank you! In the mean time I continue to fight the good fight by not succumbing to cynicism, despite all the ‘crap’ and easy pickings of identification with ‘victim’. Thank you, and I like what you’re saying. Chiron is currently conjuncting my Sun and I have to tell you that this idea seemed to arrive in my mind almost out of nowhere as I struggled with the deeper meaning of the Doctor. Yes how curious it is that there is a chiron return – chiron the little lump of rock that includes career and what we do for a living. If BBCA keeps running DW, I may be able to work back through the earlier incarnations. Now, to address the Chiron postulate, I would also nominate Torchwood’s Capt. Jack Harkness as an avatar of the Wounded Healer. He’s immortal but certainly gets banged up a lot — his torture in Immortal Sins seemed almost like the Crucifixion. And Jack’s mission seems to be protecting Earthlings from enemies foreign (alien!) and domestic. So … does that mean Jack is Christ (Chiron always felt like a Christ figure to me), and, if so, is Doctor Who the Holy Ghost or God? So if he’s God, does that make Rose Tyler the Virgin Mary? Sue Perkins for the next Doctor! I must admit I love the campy show. My fave doctors are John Pertwee and Tom Baker. My sister and I used to hide behind the sofa even when the music came on – but do you notice how even the British Army was depicted as evil and mysterious in some of the episodes? It wasn’t just the Daleks, who couldn’t get up the stairs… it was everyone in authority…and inevitably, there was one girl at school we used to call Stavros. I just started therapy recently, long overdue, I’ve been trying to get it sorted since I was in the thick of the uranus/pluto squares. I was wondering how I proceed. I can just think about Jodie Whittaker as the new Doctor. Simple. The person I was has gone. So who do I want to be? I grew up with the bionic man and bionic woman, I don’t see this as a sad thing, I see it as rebuilding, only, instead of being shaped by others, I get to make the decisions. Identity is very much on my mind still since mine went awol. Chiron is the wound that doesn’t heal. Jodie as the Doctor has coincided with Me Too, Jupiter in Scorpio, challenge to patriarchy, misogyny, inequality. Venus went retrograde in Scorpio yesterday just as Kavanaugh was confirmed. Scorpio makes Venus very angry! Jodie as the Doctor is focused and not to be messed with. She’s powerful. The show was broadcast simultaneously worldwide, trending in Twitter immediately. The whole world is getting this message at the same time. The UK’s identity is in tatters. Same as mine. Those uranus/pluto squares again. There are still people who haven’t realised the country’s good reputation has gone, Brexit has made us a laughing stock. The Tory government has made us politically irrelevant. There are the British values as seen on TV (Downton Abbey type myth-making), and then there’s the stark reality of racism, xenophobia, Trumpian thinking. If they could build a wall in the sea, I think they would. There is much to heal. Will Doctor Who help towards it? just scrolled up to read the other comments. I forgot I had my chiron return at the same time as the uranus/pluto squares. When it rains, it pours.